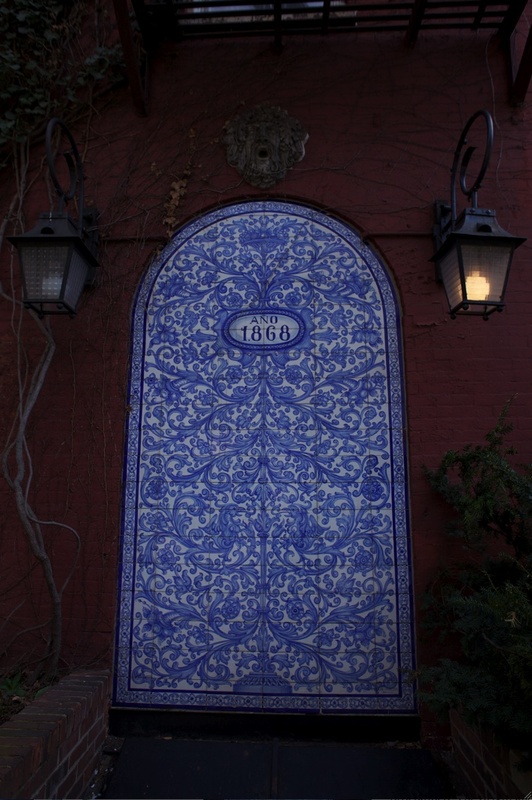 At 88 Perry Street, just off the corner of Bleecker, there is a blue and white tile installation elegantly flanked by two carriage lamps. The colors and motifs of the mural are typical of ceramics in southern Spain, and the tilework contrasts beautifully with the red brick wall of the building in which it is set. The piece bears the inscription “Año 1868,” the year in which Spain’s First Republic was proclaimed. The origin and history of this ceramic tile installation remain shrouded in mystery. Uncorroborated reports on the internet claim that in 1972, when renovating the restaurant located at 88 Perry Street, the building owners commissioned a Spanish artist from Seville named Rodriguez to install the mural in a recessed section of the wall, where, it seems, there had once been an arched door. We have been unable to find any information about this Rodríguez or about possible explanations of the curious inscription. 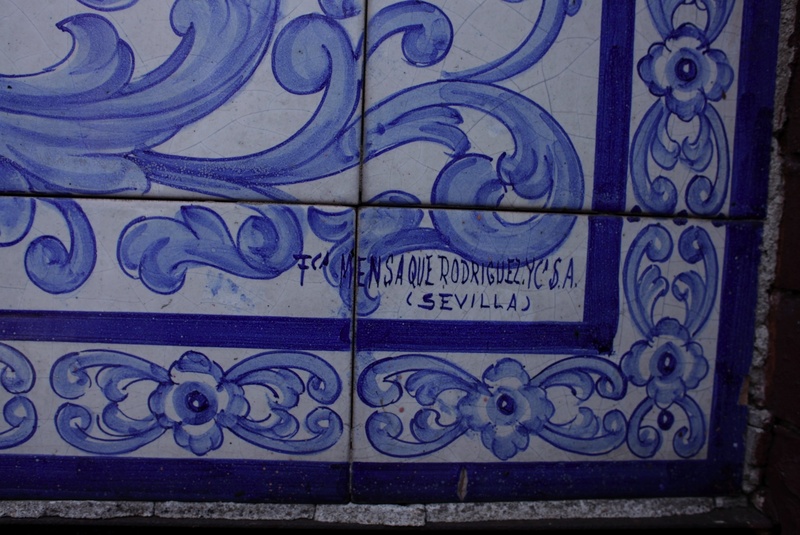 The attribution to a “Rodríguez” might be a misunderstanding, as a small inscription on the lower right-hand corner of the mural reveals that the tiles were created at the Fca (Fábrica) Mensaque Rodríguez y Compañía SA, in Seville, Spain, a prestigious factory of bricks and ceramic tiles that opened it doors in 1917 and went out of business in 2006. The Landmarks Commission of New York and the residents of Greenwich Village have been arguing since 2009 about (re) moving the tile mural. The tenement building is a registered historic landmark. Apparently, when the mosaic was commissioned and installed in 1972, approval was never petitioned from the proper authorities. The Landmarks Commission wants the mural removed and the wall restored to its condition and appearance of 1972. Residents of the neighborhood do not understand the sudden fuss about the artwork’s existence and insist that the arched tile mural is a beautiful addition to the neighborhood. Indeed, the mural itself has become a kind of unofficial landmark and meeting point for folks in the West Village. And a haunting trace of the presence of Spain and Spaniards in Greenwich Village. Sadly, the carriage lamps are gone. The First Republic was born out of what is know in Spain as The Glorious Revolution or, “La Gloriosa”. Considering the recent events in Spain (the abdication of Juan Carlos), perhaps we are in the threshold of the Third Republic (the Second, from 1936-39, was brutally overthrown by Franco).